Our product range includes a wide range of moringa powder. Backed by our years of industry experience, we are betrothed in presenting an excellent quality of Organic Moringa Powder. To preserve the natural nutrients of the leaves, the complete process is taken through a careful state of the indulgence. This powder is developed from Moringa leaves. These leaves are warily washed and dried at low temperature. Offered leaves contain high vitamins, phytonutrients, antioxidants, and amino acids. The leaves are not dried using blowers or any heat emitting machines at any stage of the processing. 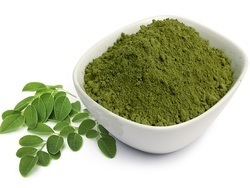 Looking for Organic Moringa Powder ?